exercise | Masters of What? 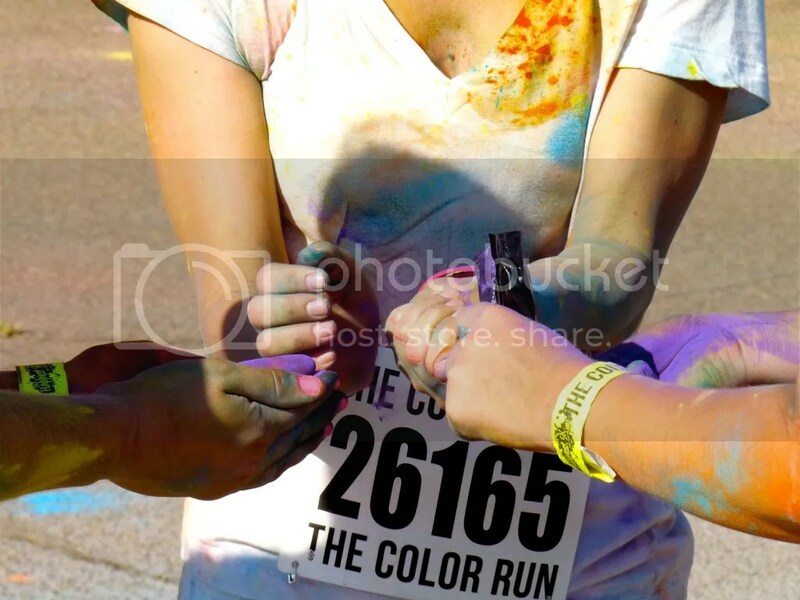 The San Diego Color Run took place last Saturday and I’m still finding tinges of blue and green in my ears. Both Nicole and I participated for the first time in this fun event, but on different teams. 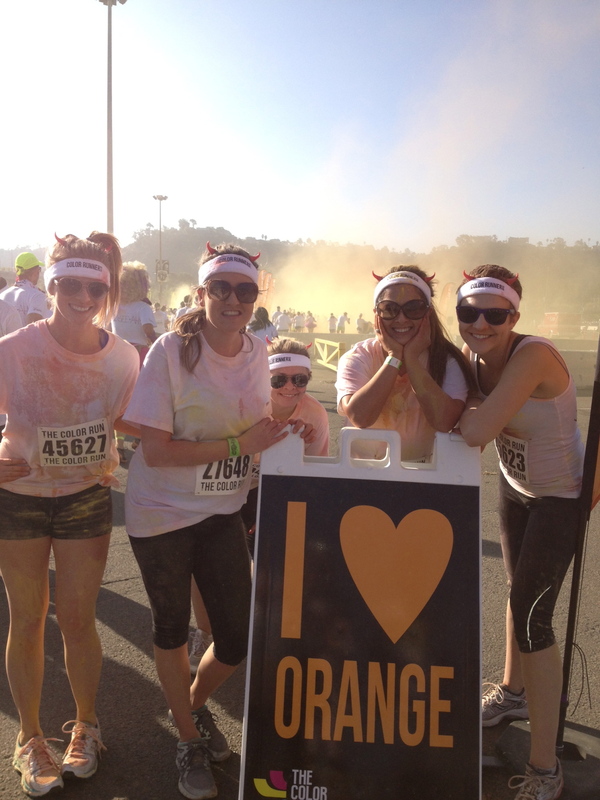 Nicole and her team, Hell on Heels, ran early at 8:30 a.m., while I ran with team Colorly Love during the 1:30 p.m. race. So, as incredibly fun and hilarious as this event turned out to be, we learned a few tips and tricks we will be employing during next year’s run. Painter’s Masks: These folks really stood out, plus since these masks are meant to be worn for a while I assume they weren’t as hot as some other options. Bandannas: This option looked cool (a very robber-esc look) but I’m not sure it worked in the long run since it seemed that the colors were attracted to moisture – which I assume would accumulate with the breathing. Same issue as above, the billowing power can get into your eyes and cause irritation. Plus, some of those color sprayers don’t quite adhere to keeping it below the neck (I will let some of it slide because they were little kids and their aim may not be quite up to par). Our teams both just wore glasses (both sunglasses and clear lenses), but we also saw some people wearing goggles, both the swimming type and science lab type! 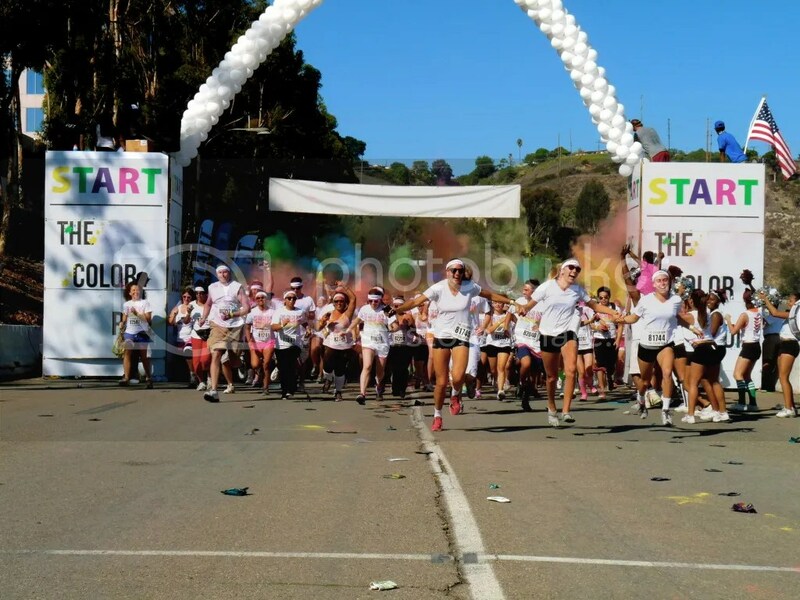 wearing white, TONS of people will have on the event T-shirt, and there will be rainbow-colored tutus in masses. Many people opted to keep their cellphones safe from the color, so if your team is separated, it was almost impossible to find each other. Find SOMETHING that will stand out… whether it be little horns like Nicole’s team or matching headdresses. At the post-race event dance party there is a special dance set aside for those wearing tutus. If you want to shake your stuff while everyone looks on be sure to be wearing one! color-pack make sure you get the pretty colors: purple, pink, blue – the rest soon turn you into a brown mess. When you’re throwing your color-packs ensure you have DIRECT contact with a team member, I’m talking a handful of color literally smacked on there and rubbed in for maximum color saturation. We also saw evidence of people bringing in their own color (we’re talking empty Ziploc baggie proof)!!! Team Colorly Love decided that our next go-around we’ll be smuggling in our own colors, and making sure they’re the pretty colors (no ugly yellow or orange!). I found a website with a recipe to make the colored powder. I haven’t tried it yet but feel free make some and leave us a comment on how it worked! Any other tips we missed? Could we have had an amazing inside experience and missed it? Let us know in the comment section so our next 5k or next Color Run is EPIC!